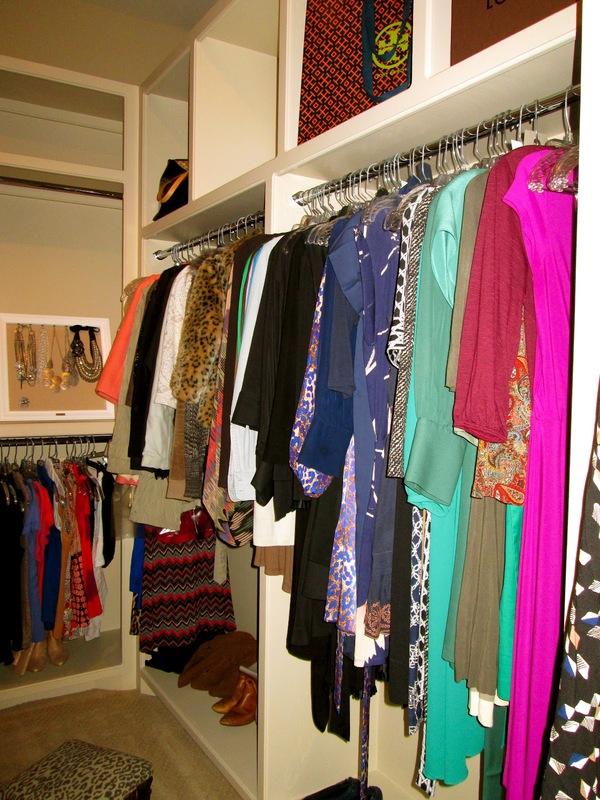 Closets are the woman's equivalent to a man cave- a sacred place that should be kept both beautiful and organized. This isn't always easy, especially when we rush each morning to find something to wear to work and bolt out the door, leaving all the rejected outfits strewn across the floor (or is that just me?). Today I thought I'd share a few tips/tricks that I utilize to help keep my closet as organized and pretty as possible. 1.) Organize clothes by color and type. 2.) Replace mismatched and wire hangars with sturdier ones that are the same style. 3.) Edit your closet on a regular basis. 4.) Add personality to your space. 5.) Keep shoes and other accessories grouped together and visible. If you don't have enough room for them all, at least make visible the 2-3 pairs you wear the most often. Do you have any tips of your own to add? I'd love to hear them! Read more pretty organization posts here. I also have a leopard faux fur jacket I cannot part with..I've never worn it..I keep thinking one of these days I'll do something glam enough to require it! Thanks Samantha! This is exactly what I do. I use the white hangers from Walmart or Target. They are $3-$5 for 10hangers and they look great. I am needing a closet makeover right now and this just may have been my inspiration - love your print!! A. your closet is ginormous B. It looks so beautiful and organized. Ugh. I did buy those huggable hangers and got rid of all mismatched ones but that's as far as I've gotten. You have inspired me to clean it up!!! great tips! and hello fellow houstonian! I am super jealous of your closet! 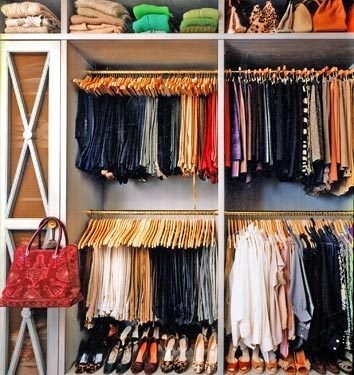 I dream of having a beautiful huge closet one day that is perfectly edited and organized. These are great tips- I also love the shopping bag thing as well! i spy a leopard print jacket & i am extremely jealous! love your style love. having a closet that is that organized would make picking out clothes in the morning a heck of alot easier! Great closet organization, it looks fantastic! You have an amazing closet and so organized, too! 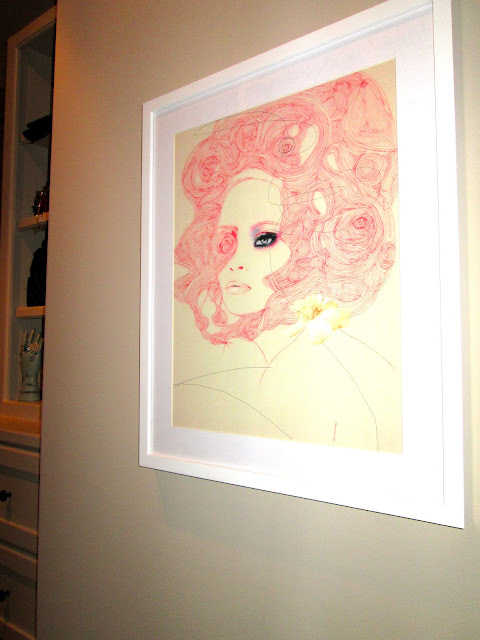 Love the print from Leigh Viner so much. I am a fan of her work. What a great place to put such a feminine print. Have a great week dear! Love your closet and tips. I, too, have an enormous leopard coat I cannot part with. I've tried passing it off as decor. I want your closet space! I need a walk-in so badly! ;) great tips! I just fell in love with your blog! Great work! I especially love this closet post! Who doesn't want the best walk-in-closet ever! UM, your closet is gorg and has given me inspiration for the much needed facelift my closet deserves! Any suggestions for a closet that I share with my hubby? All his clothes are on the top and mine on the bottom but between us we have so many clothes its hard to keep organized and pretty. We only have one small dresser too.